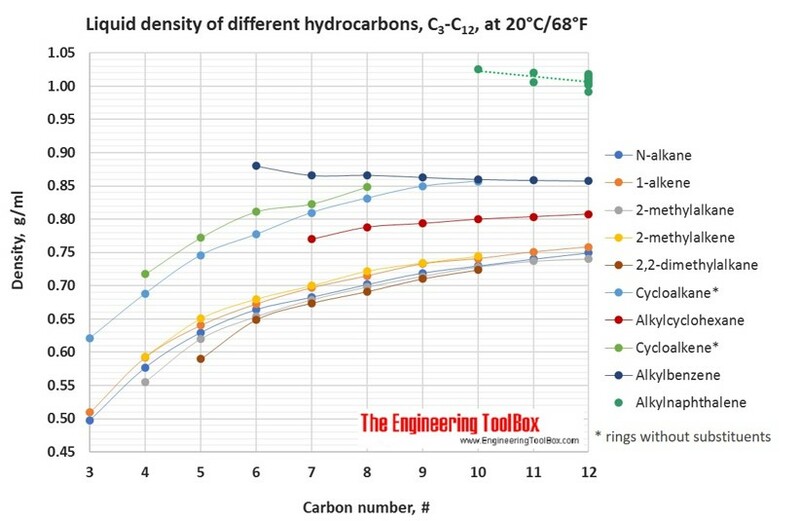 The tables and figures below show how the liquid density at 20°C (68°F) changes with increasing carbon number up to C33 for different hydrocarbons. The densities are also shown as function of boiling point of the hydrocarbons. Definitions and examples of molecular structures of the different classes of organic compounds are given below the figures. See also boiling and melting point of the same compounds, densities of organic sulfur compounds and density, boiling and melting points of nitrogen and sulfur compounds. 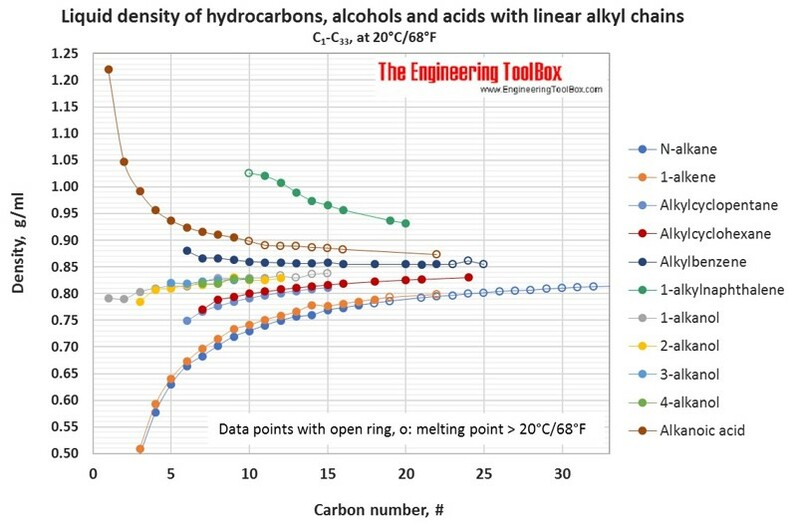 See long list of hydrocarbons - physical data, including molweight, melting and boiling point, density, flash point and autoignition temperature, as well as number of carbon and hydrogen atoms. 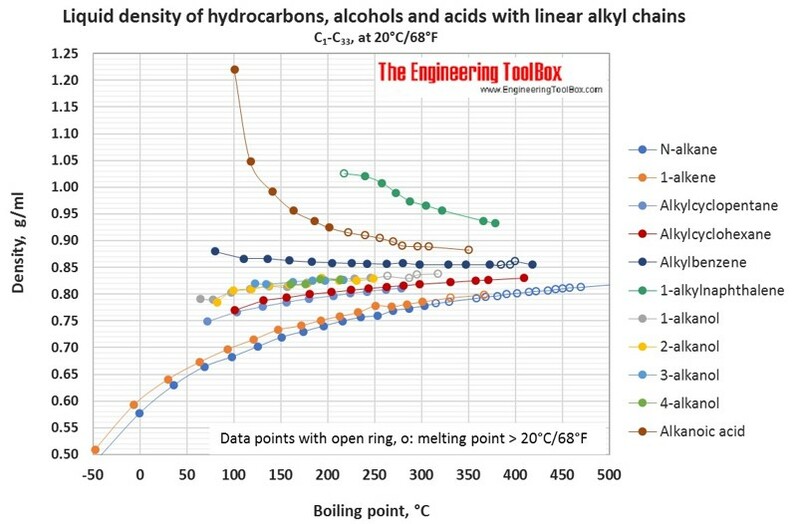 For hydrocarbons with melting point > 20°C, the liquid density at 20°C is extrapolated from density measurements just above the above melting point. Alkene: An unsaturated hydrocarbon that contains at least one carbon–carbon double bond, with the general formula CnH2n. Also called olefine. Alkyne: An unsaturated hydrocarbon containing at least one carbon—carbon triple bond, with the general formula CnH2n-2. Also called acetylene. Cycloalkane: A one-ring (monocyclic) saturated hydrocarbon, with the general formula CnH2n. Also called naphthene. Cycloalkene: An alkene hydrocarbon which contains a closed ring of carbon atoms, but has no aromatic character, with the general formula CnH2n-2. Also called cycloolefin. Aromatic hydrocarbon: A cyclic (ring-shaped), planar (flat) molecule with a ring of resonance bonds that exhibits more stability than other geometric or connective arrangements with the same set of atoms. The simplest of the aromatics have 6 carbon atoms and contains 3 double bounds. A one ring aromatic without any substituents is called benzene, with the formula C6H6. Polycyclic aromatic hydrocarbons: hydrocarbon that are composed of multiple aromatic rings. A two ring aromatic without any substituents is called naphthalene, with the formula C10H8. 2-Methylalkane: A branched alkane, with a methyl group connected to the second carbon atom in the main carbon chain. 3-Methylalkane: A branched alkane, with a methyl group connected to the third carbon atom in the main carbon chain. 2-Methylalkene: A branched alkene, with a methyl group connected to the second carbon atom in the main carbon chain. Alkylcycklohexane: A monosubstituted cyclohexane with one branching via the attachment of one alkyl group on one carbon of the cyclohexane ring, with the general formula CnH(2n+1)C6H11. Alkylcycklopentane: A monosubstituted cyclopentane with one branching via the attachment of one alkyl group on one carbon of the cyclohexane ring, with the general formula CnH2n+1C5H9. Alkylbenzene: A monosubstituted benzene with one branching via the attachment of one alkyl group on one carbon of the benzene ring, with the general formula CnH(2n+1)C6H5. Alkylnaphthalene: A monosubstituted naphthalene with one branching via the attachment of one alkyl group on one carbon of one of the aromatic rings, with the general formula CnH(2n+1)C10H7. Standard test methods (ASTM and others) for crude oil properties - An overview of common test methods and typical ranges of variation of petroleum quality parameters. What, why and how do the different test? Engineering ToolBox, (2017). Hydrocarbons, linear alcohols and acids - densities. [online] Available at: https://www.engineeringtoolbox.com/density-alkane-alkene-benzene-carbon-number-alcohol-acid-alkyl-alkyne-d_1939.html [Accessed Day Mo. Year].